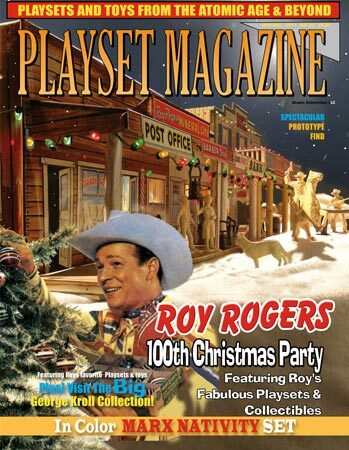 Issue 60 - Roy Rogers 100th Christmas Party! As we approach the silent night and chill mornings of glorious Christmas, we look back at the rare and uniquely beautiful Marx Nativity and Apostles sets. Each of these is loaded with color and marvelous sculpting and each has its own mysteries. We start our coverage by “peeling back” the mask of myths to reveal the true Marx Christmas stories – Two of them! -- surrounding these gems of the season! I can smell the hay and warm animals even as I write this. The featured story this issue is the big ‘Roy story’ by Gary Carlington, a PMer whose family met Roy and Dale Evans, and he will be our host for a tale about that very meeting and toys he brought to us all. Gary has been an avid Roy Rogers collector, even has his hat and boots, but we're concentrating on those all-important toys this time. It’s what we call Roy’s 100th Christmas Party and Birthday celebration, and you are heartily invited! INCREDIBLE PROTOTYPE FIND COVERED – WHO REALLY MADE THE AUBURN FIGURES! And we break some really important news, news of a huge find of previously unknown prototypes, and Johnny Ringo is among them! And Marx’ unknown German soldier and prototypes of others! And a tremendous reveal of who really made Auburns figures! You’ll be talking about this for years to come I bet. At least, I sure will. Then of course we have our annual OTSN coverage to beat the band. Yep, last issue we hung out the old “Gone Huntin’” sign to attend the great OTS playset debuts from the world’s great impresario manufacturers, Ron Barzso and Toy Soldiers of San Diego. Folks, we hope you are supporting’ these gentlemen and their efforts. You’ll see stampeding buffalo, new Indians, tromping hoards of Roman Legions and Barbarians, siege machines and much more. This is a wonderful time to be collecting toy soldiers! Folks, it’s a delightful Christmas blend of flavorful old and snappy new, and its on its way to you right now! And we hope you can spend some quality time with family, all snuggled up warm and toasty by the hearth this time of reflection and peace on Earth. Have a wonderful Christmas holiday everybody!